TS-85 Synergel LT Lubricant is not only an excellent stainless antiseize, but, also an excellent bearing lubricant where severe loading and extreme temperature are common. Due to Synergel LT's tendency to "stay put" and its high solids content, it is recommended only for bearings operating at lower speeds. TS-85 Synergel LT is usable at constant temperatures from -50°F to +350°F. TS-85 Synergel LT is named for both its synthetic fluid components and its synergistic blend of solid lubricating additives. 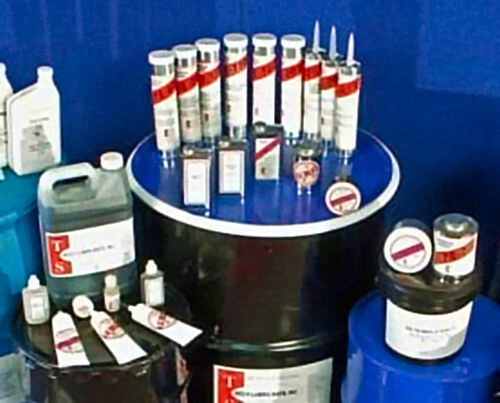 Each of these materials provides excellent anti-wear/extreme pressure performance. In combination, however, they are significantly more effective than any one of them by itself. In use, Synergel LT exhibits a polishing action which tends to "smooth out" worn areas on the metal surface. In addition, deposits of molybdenum disulfide are formed on the peaks of asperites providing a smooth laminar flow of metal to metal. Repeat make & break of fasteners or fittings lubricated with Synergel LT will result in a highly polished threaded area. TS-85 Synergel LT adheres readily to metal and is easy to apply.